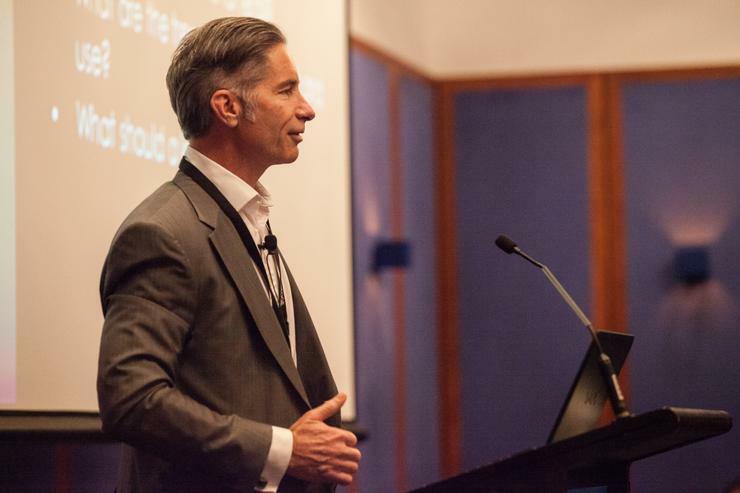 ARN Hall of Fame inductee and VMware’s director of channels and general business, John Donovan, and senior product marketing manager, Aaron Steppat, took to the stage at ARN and New Zealand Reseller News’ EDGE 2015 conference in Port Douglas, to discuss the changing role of the channel in an age of disruptive technology. Donovan opened the presentation by discussing VMware’s changing role in the marketplace, from that of a compute virtualisation solution, to virtualising everything in the datacentre and tying it all to Cloud. “We’re not just leaders in compute virtualisation, but the extension of that into the software defined datacentre. It's about looking at the virtualisation of those layers into the datacentre. That includes compute, networking, storage,” he said. As part of this, IT has rapidly moved beyond a technical discussion. “The role of the channel is to create a much tighter relationship between you and your customers. You’re not just suppliers of technology, you’re suppliers of transformational technology that impacts business transformation as a whole,” he said. VMware is now the fifth largest software company in the world, with $US6bn revenue in 2014, 500,000 customers and 18,000 employees worldwide. In Australia, VMware has 700 active accounts, 6 distributor and aggregator partners, and 298 competencies held by partners. A key focus of this has been the focus on the channel, which accounts for 97 per cent of the company’s revenue by volume, he said. Now that IT is the key driver of business transformation, the role of trust and the leadership that helps bring, has been key. IT is now more personal than ever before. Customers feel a personal connection to the market, Steppat said. Products such as Netflix, AirBNB and Uber, have removed the facelessness of IT. With new challenges, come new competitors, and the personal connections and the relationships that the channel make are now more important than ever before. “When something goes wrong, customers will tell ten people. When something goes right, they’ll tell two. Bad news travels fast, and feedback is now so important,” he said. The brave new world of IT is based around five key attributes. Customers want results instantly (“on demand”) – or else they go to Shadow IT (such as their own Dropbox), and the channel needs to be fluid. “What I want on day one may not be the same as on day two, or even the next month,” Steppat said. Security is another key facet: it is now not just a legal concern. The loss of data can be catastrophic for brand identity, and thus the company as a whole. Most importantly, Brave New IT is about being a Swiss Army knife – it has to be optimised for the development and delivery of all apps – from the traditional, client-server applications through to modern cloud native apps – all running on any device, and securely. “To truly transform, and keep up with the expectations of business, IT must face these challenges and uncertainty with a bold and decisive attitude, and make thoughtful, calculated moves to a new model of IT,” he said. VMware believes that we are at the same point with the Software Defined Datacentre and Networking that we were 15 years ago with virtualised compute. That means customers want to be able to access their data and action it on any end device, from a laptop or tablet, through to a smartphone and eventually their cars, or other Internet of Things based tech. VMware launched vCloud Air locally in April this year, and Steppat took the time to lay out some of the company’s big successes here, and in overseas markets. He used the example of United Airlines in the US and how it embraced mobility to achieve its outcomes. “One of the biggest costs to airlines is weight. What does weight equate to? Fuel cost,” he said. The flipside of that can be just as costly. Availability is another key attribute that end users often forget – part of hedging risk. The key focus is that this new world of IT has to go beyond simple implementation and ‘lights on’ IT, and focus on innovation to get that competitive edge. Medical technology company Medtronic has used VMware’s Cloud-based solutions to get IT response times down by 90 per cent. US electronics retailer Lowe’s gave 43,000 store clerks in 1700 US stores an iPhone with an app on it that gave them instant access to inventory availability, merchandise details, and pricing information – effectively cutting response time down to zero for customer enquiries.